The best lawns and gardens have one thing in common - good soil. Testing your soil is the first step in ensuring your lawn or garden has all the necessary nutrients needed to be beautiful and bountiful. Michigan State University (MSU) Extension makes this testing process quick and easy by offering new soil test kits through the MSU Extension Bookstore; visit http://www.bookstore.msue.msu.edu/ to order your Soil Test kit online for $20 plus tax. "Currently soil testing is not used to the extent it should be by homeowners and gardeners because many people don't think about it, or they think it's easier to just grab a product off the shelf," said MSU Extension turf specialist Kevin Frank. "Soil testing is important, though, because not only will it let you know what nutrients you might need to apply, but if you don't need to apply anything you can save money and time." While MSU Extension has offered soil-testing services for many years the new soil kits will streamline the process so homeowners can get results more quickly. The kits include a soil bag, mail-in envelope, directions for taking soil samples and information about what your results tell you. "One of the most unique parts of this kit is that your results will be emailed directly to you," Frank explained. "From there, your results will be linked to a website that gives you products you may want to use and application rates." The new kit is the first effort of its kind for MSU Extension and is presently available for testing the soil in lawns or vegetable gardens. Testing for other garden plants will be added in the future. Farmers who want to test their fields or homeowners who want to test soils before they plant trees or shrubs will need to continue to take soil samples to their local Extension office. The availability of easy-to-use soil test kits will become increasingly important for homeowners in the future. Effective January 2012, Michigan law prohibits anyone from applying phosphorus to lawns without a soil test recommendation. "Testing helps our environment by letting us know what the soil needs. This protects our water supply by reducing the chance of over-applying nutrients," Frank said. Once soil samples are tested by the MSU Soil and Plant Nutrient Lab, results will be emailed along with recommendations for product application. Homeowners who have questions after receiving their results and visiting the website should contact your local MSU Extension office. 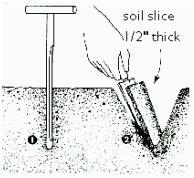 A soil test is only effective if the sample is a good representation of the area to be tested. For a large lawn or garden, 15 to 20 sub-samples of soil should be taken. For a small lawn or garden, 5 to 10 sub-samples should be taken. Take sub-samples in a random or zig zag pattern. Avoid road edges, next to concrete foundations, walks, etc. Take samples at 4" deep for turf and 6" depth for a garden. Mix your sub-samples together to create a 3 cup soil sample for each area you want tested. Air dry the soil on paper for 24 hours (never oven dry). Submit your samples as per kit instructions. Please DO NOT take samples to the local MSUE office. This page last updated on 7/1/2013.